Mayor Rahm Emanuel says work toward promoting Uptown as a music destination has started with new L stations and monthly music and theater fest called Uptown Saturday Night. UPTOWN — Just before being sworn in as mayor, Rahm Emanuel first floated the idea of an Uptown music district while talking to “your best friend in the whole world” WXRT DJ Lin Brehmer. “You have the Riv, you have Aragon. … We have a Downtown theater district. Should there be an Uptown music district, given our history with labels as well as the club scene, which is truly, truly unique around the country?” Emanuel asked on the air in 2011. From there, the Uptown music district idea took on a controversial life of its own. Plans included new lighting and signs, a “people plaza” and “people street” to mark the peculiar crossroads at Lawrence, Broadway and Racine where folks flock to hear live bands at the Aragon Ballroom, Riviera Theatre and Green Mill jazz joint, and there's the lingering hope that one day bands will return to the historic Uptown Theatre, too. Over the last four years Emanuel has been accused of being “all talk, no action” when it comes to making his big idea a reality. 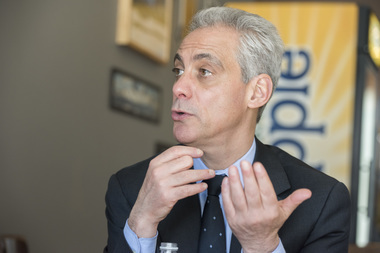 So, when I sat down with Emanuel on Tuesday, I asked him about the chances that Uptown will ever become a live music mecca, given the neighborhood's struggles with warring gang factions and dense population of mentally ill people that has negatively affected the quality of life. Emanuel pointed to recent improvements at the Lawrence Red Line station and the ongoing upgrades at the Wilson "L" stop — track improvements, adding brighter lights on Broadway, restoring the 1923 station house and former clock tower, installing new signs and streetscapes that aim to turn the dingy eyesore into a more heavily trafficked commercial district — scheduled to be completed by 2017. The mayor says people who say he’s not moving forward with the music district plan are wrong. And, Emanuel said, the recent addition of a First Ascent, a rock-climbing gym of sorts, as a tenant in the long-vacant building once housing Borders bookstore further strengthens the commercial district. 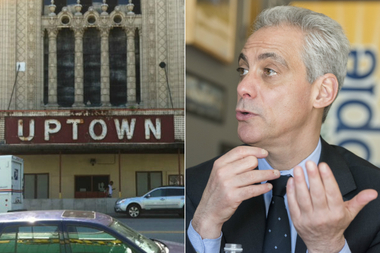 Under the time crunch of a lunchtime interview, I wasn’t able to get into more detail about the future of the dilapidated Uptown Theatre, which needs far more than the $10 million in public funding secured by state Sen. John Cullerton to be fully restored. But Emanuel pointed to a new monthly music and theater event, "Uptown Saturday Night" — a collaboration between the city’s cultural affairs department and Uptown United that’s set to start up April 11. Uptown United spokesman Keith McCormick said the goal is to change the way people think about the neighborhood as an entertainment destination by producing shows at places that don’t get a lot of attention such as Pivot Arts and Flats Theater, a former vaudeville stage. "Uptown Saturday Night" is an attempt to highlight the best Uptown has to offer, McCormick said. "Typically, you go see a show, have dinner on Argyle, [people] do their thing and go home. And we’re trying to create a whole night with a variety of things, live theater and live music, so you can walk from one thing to the next to the next,” he said.